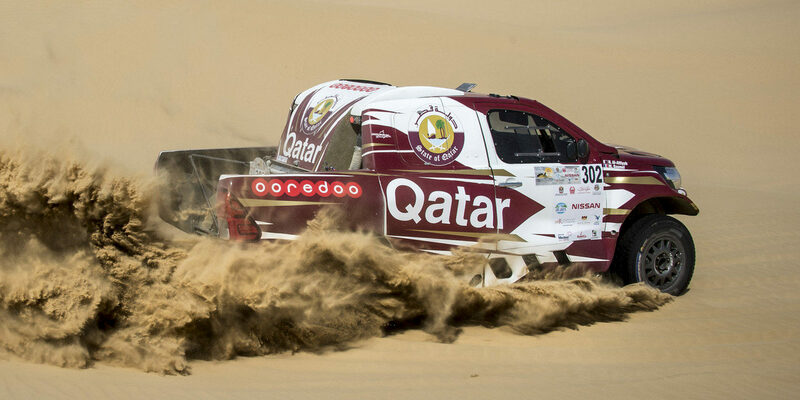 Qatar’s al-Attiyah aims to impress in Morocco - The Maghreb Times ! Overdrive Racing is making its final preparations for the company’s second busiest week of the season after the Dakar Rally by fielding nine Toyota Hiluxes in the six-day Rally of Morocco. The penultimate round of the 2018 FIA World Cup for Cross-Country Rallies starts with a Prologue stage on (October 4, near Fes, and finishes on Tuesday, October 9 after five desert selective sections and 1,362 competitive kilometres in a route of 2,051km. Russian G-Energy driver Vladimir Vasilyev and navigator Konstantin Zhiltsov are still chasing glory in the FIA World Cup. Vasilyev, 49, arrives at the north-eastern Moroccan town of Fes trailing series leader Jakub Przygonski by 71 points in the Drivers’ Championship. While the Pole is the strong favourite to win the title for the first time, 60 points are at stake for the winner in Morocco and a further 30 are on offer at the last round in Portugal later in the month, so the Baja Spain winner – who finished third in both Hungary and Poland during the summer – still has a mathematical chance of winning his second title. Overdrive Racing will also oversee the running of a trio of Toyota Gazoo Racing South Africa Toyotas featuring the team’s latest innovations and revisions. The entire team tested in the Moroccan deserts in the days building up to the event and Qatar’s Nasser Saleh al-Attiyah, South Africa’s Giniel de Villiers and Dutchman Bernhard Ten Brinke will be hoping for a successful test and an impressive showing in the Moroccan event that acts as a vital pre-Dakar Rally shakedown for the entire team. Al-Attiyah was unable to defend his FIA World Cup title on this occasion. A couple of mechanical failures cost him dearly in Qatar and Kazakhstan after he had won Baja Russia and the decision to miss the Abu Dhabi Desert Challenge meant that his title bid was over long before he and French navigator Matthieu Baumel finished second at the non-championship Silk Way Rally in Russia. An injury to co-driver Robert Howie sidelined De Villiers prematurely in Qatar, but the consistent South African has been working on the development of the Toyota Hilux behind the scenes and the goal of continuing a string of Dakar podium finishes will be boosted no end by a good result for him and new French navigator Alexandre Winocq in Morocco. Ten Brinke teams up with Frenchman Xavier Panseri in the third of the Toyota Gazoo cars, the Dutchman keen to put in some competitive times before the Dakar in January. Poland’s Aron Domzala holds eighth in the FIA World Cup standings after a mixed season that included fourth places in Spain and Qatar. He and fellow countryman Maciej Marton crew the fifth car. The experienced Dutchman Erik van Loon returns to the hot seat for the first time since finishing sixth in Spain with Wouter Rosegaar. But Van Loon also has a new co-driver for his Moroccan challenge. Harmen Scholtabers will co-drive the sixth of the Toyotas. Saudi Arabia’s Yasir Seaidan returns to competitive FIA World Cup action for the first time since missing Rally Kazakhstan. The Saudi was the revelation of the earlier rounds of the championship and finished third at the Dubai Baja and in Qatar back in April. He will be partnered by Russian navigator Alexei Kuzmich. Frenchman Ronan Chabot returns to the driving seat in the eighth of the Toyotas with co-driver Gilles Pillot and the all-Chinese crew of Yuxiang Liang and Kou Hongtao round off the truly international Toyota team line-up in Morocco. A Prologue of 10km loops around the desert near Fes to determine the opening stage running order for the top 10 crews on October 4. The first of the desert selectives starts out of Fes on October 5th and is split into two timed sections of 103km and 91km before arriving in Erfoud – an oasis town situated in the Drâa-Tafilalet region of eastern Morocco. The second, third and fourth selective sections of 329km, 289km and 342km loop around Erfoud on October 6, 7 and 8 and action draws to a conclusion with a fifth section of 198km en route to the finish in Fes on October 9.